The equipment presented included two delivery sets, 20 mosquito nets, eight artery forceps and five bicycle covers. The items were presented by our Country Director for Ghana, Tom Davis. In his presentation speech, he reiterated the commitment of Projects Abroad to improving the delivery of health care to all Ghanaians. Davis said that the donation would not be a “nine-day wonder” and promised to renovate the maternity ward of the hospital and help address other challenges facing it. 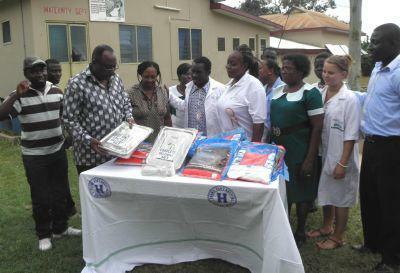 Accepting the gifts on behalf of the hospital was acting medical supervisor, Dr George Gyau, who thanked Projects Abroad for the gesture and welcomed the future plans for renovating the maternity ward.